Water coming into your home, whether from municipal sources or a well, may contain impurities and contaminates that affect the taste, smell, and safety of the water you're drinking and cooking with. Pollutants such as lead, mercury, dirt, rust, silt, cysts, benzene, or chlorine can be found in regular tap water, resulting in cloudy and unsafe drinking water and ice. 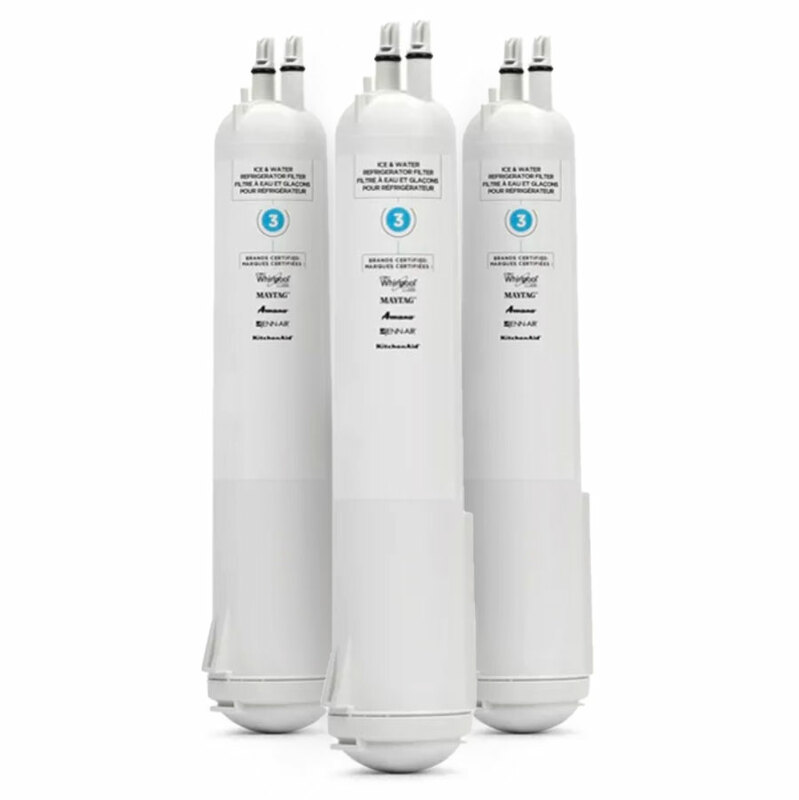 The Whirlpool 4396710 refrigerator water filter removes these impurities through the use of a block of activated carbon. As the water passes through the filter, contaminates are captured by the carbon and fresh, clean water is passed through, giving you healthy, better tasting water and ice. The Whirlpool EDR3RXDI filter has NSF/ANSI ratings for standards 42 and 53, certifying the removal of chlorine taste and odor, and other contaminates such as sediment, sand, rust, lead, cysts, and other particulates. For the best performance, these filters should be changed every six months. As always, get free shipping and returns on all fridge filter and air filter purchases. 77 compatible alternative filter models below. Marvel at the specifications of our 4396710 compatible filter. If you're looking to have cleaner and healthier water, then this is the filter for you. The factory original Whirlpool 4396710 filter fits into multiple Whirlpool refrigerators as well as many other refrigerator brands. I hope your thirsty, because this filter can clean up to 200 gallons of water before needing to be replaced, which is usually about every six months. The Whirlpool replacement filter is certified to meet NSF/ANSI standards 42 and 53, meaning it is certified to reduce chlorine, chemicals, minerals, dirt, and cysts from your water. Once easily installed, this filter will deliver your water at a steady pace of half a gallon per minute. It has an optimal temperature range of 33-100 degrees and an optimal pressure range of 30-100 PSI. This filter will take away any doubts that you have about your water so you can drink and cook with your water worry-free. Very clear on how it works and really makes the ice nice. I received them in a very short time so you do take care of your customers. Also your site is clear and easy to understand. Nice not to have to go chasing around town for what you need. My frige is a Kenmore, made by Whirlpool. The Whirlpool filters are the same as Kenmore at 1/3 the cost. Filters tested against NSF/ANSI Standard 42 (aesthetic effects) are certified to reduce specific aesthetic or non-health-related contaminants (chlorine, taste and odor, and particulates) that may be present in public or private drinking water. See filter performance data sheet or manufacturer's packaging for details. Filters tested against NSF/ANSI Standard 53 (health effects) are certified to reduce specific health-related contaminants, such as Cryptosporidium, Giardia, lead, volatile organic chemicals (VOCs), MTBE (methyl tertiary-butyl ether), etc., that may be present in public or private drinking water. See filter performance data sheet or manufacturer's packaging for details. Some filters that are not NSF/ANSI rated are still constructed from NSF/ANSI rated components.